The Coastal Endurance Oregon Offshore Cabled Deep Profiler Mooring is located on the Continental Slope, approximately 550 meters deep. The Continental Shelf-Slope area off the Oregon coast is a highly productive, dynamic upwelling environment. Upwelling brings nutrients to the surface sparking primary production and fueling the food web. In recent years, upwelling has also brought onto the shelf hypoxic, low oxygen, waters that can be harmful to organisms in the area. By sampling in this area, the OOI seeks to gain better insight into upwelling dynamics of this system. As with other Cabled Deep Profiler Moorings, this mooring contains a Wire-Following Profiler and is attached to a fiber-optic cable. 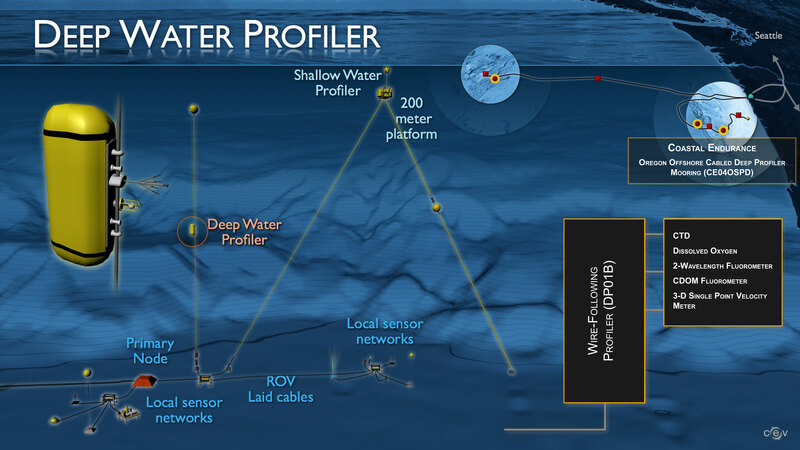 The Wire-Following Profiler houses scientific instrumentation and moves through the water column along the mooring riser, continuously sampling ocean characteristics over a specified depth interval (175 meters below sea surface to near bottom). The fiber-optic cable provides the mooring with a large supply of power and bandwidth and is co-located with a Benthic Experiment Package, that collects complementary seafloor data.